Fitting name for this black, oily, sticky-smelling hemp seed-infused Black Ale—or, as they call it, an Imperial Black IPA. By far one of the most epic heads; the black color of this brew is inviting, too. Thick resin of citric hop and hemp in the nose, a bit piney with mild chicory and cocoa powder from the malt, and ripe fruit from the alcohol. Pungent hop smack tackles the palate hard, sticky resin with evergreen and mixed citric flavors. Malt sweetness and the blackness behind it break through just enough to keep the beer in balance. Alcohol is a bit amped up, but not hot. Hop and hemp flavors stay for a while during a semi-roasted bittersweet finish. Wow, a lot to take in. But in the end, this ale works, as all flavors meld well together. Pours a dark, almost black, deep brown producing a huge 2+ finger, mocha, somewhat lasting head that leaves webby sheets of lace. Aroma dark malt, Hershey\'s & semisweet chocolate, toffee & faint smoke forward backed by citrus & pine hops. Taste dry & astringent, bitter chocolate, burnt, bitter coffee, phenolic, resinous hops. Finish is a continuation of the drying & astringent bitterness that intensifies & lingers long into the aftertaste. Dark, brown pour edged with a little tannish foam. Not a heavy head nor super hoppy smell as you'd expect with a double so I think that brings down its score a bit. The smell is a bit loamy and damp with some spicy grapefruit on top. And what a fantastic flavor (which is what matters, right?) Very different profile than others on the head, the smell, and look which may be chalked up to the hemp seeds, but I don't care. Fun beer...Will drink again and again. Then sleep and drink some more. Dubhe has a phenomenal label depicting Utah's beautiful star spangled desert wilderness as well as the glowing Red Giant after which it is named. Indeed "black as the night sky", the beer is also capped with a foam that resembes the surface of the moon, craters and all. Squint closely and you may be able to make out a small constellation of subtle garnet highlights. Biologically speaking, hops and marijuana are brothers from the same Cannabaceae mother. And in fact, many hop varietals actually do smell like marijuana - though none of the five types used in this recipe do. The bouquet has elements of tree resin and herbs (chive flowers especially) but, despite five pounds used per barrel, it's surprisingly the malt that dominates. The palate is no different - medium-dark chocolate, coffee beans, sweet black licorice and even a bit of raisin monopolize the senses and certainly overshadow any delicate floral or fruity flavours. The bitterness is impressionable (as you'd expect from 100 IBU) but it's actually a gentle roastiness and vanilla-tinged bittersweet quality that define the mouthfeel and aftertaste. I'm surprised something brewed with hemp would lean so far towards the malt - it's more Imperial Porter than Black IPA. Then again, let's be real: hemp is a grain just like barley or wheat. And, I'm sorry to be the "buzz kill" here, but the seeds themselves don't actually contain marijuana's active ingredient, THC (which isn't water soluble anyhow). So why use them? Bottled 8/21/12. 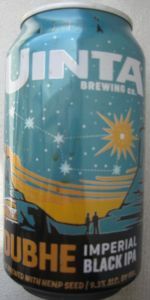 Thank you Uinta. Presently, this is the #25 ranked Black IPA here on BA. Served in a Delirium Tremens shaped glass. A: Poured blacker than most stouts on the market, with a large, 1.5 finger head with rather large bubbles. S: Ahhh... Sweet smell of pineapple upfront, infused with some dark malt. Pretty much all the usual tropical assorted cast of characters are represented here, along with a dark stamp. T: The taste upfront was definitely created by the tropical components, but the bitterness (which was substantial), was definitely the work of the darker elements. Overall, the char won out. Pretty awesome. M: I'm easy to please in this category, but oh well: Ever the slightest prickle carbonation-wise, nothing sugary here, RIDICULOUS lacing, and lots and lots of char. O: This is one style that is really starting to grow on me. I used to absolutely hate it, but in this instance, Uinta really nailed it. Kudos! Not nearly as bitter as one may assume, it is very lively across the tongue. Pours a deep black with a frothy tanned head resting on top. Slowly fades into clouds of film with a thick collar around the glass, patchy and spotty lacing left behind. Pungent hop bite in the nose, piny and resiny with some citric tones. Dark roasted malt and soft sweetness, light touch of alcohol. Smack of bitterness up front, driven by pine and resin soaked hops. Dry and aggressive, but tempered a bit by some citrus tones with orange and grapefruit, touches of pith as well. Roasted malts, light touches of chocolate and nuts, soft sweetness. Plenty of pine hops towards the finish with a bite of alcohol. Medium body, decent carbonation, a bit rough on the palate though, lingering and dry. I find black IPAs to be very hit or miss, but I was into this one. Definitely more on the aggressive side, which is typically how I like it. A - Pitch black with a touch of head and lace.